Adds key assignment to EEX to allow sto with 2 clicks. In other words, press EEX+EEX for EEX. Press Shift+EEX+EEX for ▶. Press EEX+a..z for ▶a..z (no ALPHA on needed). It also detects if a char exist before the expression/number to be wanted to store and uses Ans▶ or ▶ according to situation. When sto mode is on, ▶a..z symbol is displayed in the status bar. Additionally it works with uppercase in non-CAS mode. 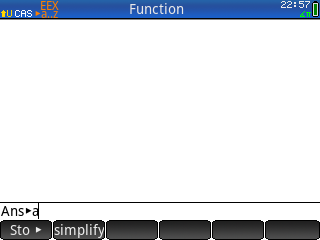 Displays all functions in the CAS/Rewrite menu with their results in a popup menu on the CAS main screen. 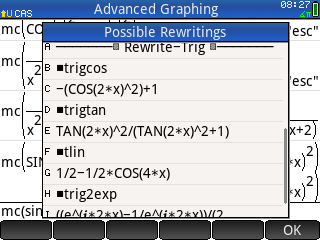 Additionally, it displays expand, proot (in second menu only), collect, and lncollect functions and their results.